When a township receives an average of 200 inches of snow each year and is responsible for 75 miles of town roads and an additional 18 miles of county roads, protecting its sand and salt piles from the elements is a necessity. Boonville township, located in Oneida County, N.Y., in the heart of New York State's lake effect snowbelt, consumes a massive amount of sand that is mixed with 10 percent salt. It has been aware of its need to get its sand under roof for quite some time, but the cost has been prohibitive for a township of its size. The solution came in the form of the Tug Hill Commission, which approached the town of Boonville, notifying it that it might be eligible for a grant that would provide the funding. The Tug Hill Commission also was willing to lead the town through the application process. With the help of the commission, funding was provided through the Preservation and Economic Development Council, which provided $380,000, essentially covering 75 percent of the building costs, leaving the town of Boonville responsible for approximately $100,000. The project was put out to bid and was awarded to Hybrid Building Solutions of Clarence Center, N.Y.
Construction on a 72 ft. by 160 ft. sand and salt storage facility with a 42-ft. high ceiling at the peak started on Sept. 11, 2018, and was completed five weeks later on Oct. 24, 2018, with a total estimated cost of approximately $500,000. The building features side walls that are 9 ft., 8 in. high and 18 in. thick, made with reinforced precast concrete. This allows stockpiles to push out against the walls of the building up to 9 ft. high before the pile starts to move toward the center of the 42-ft. high ceiling. 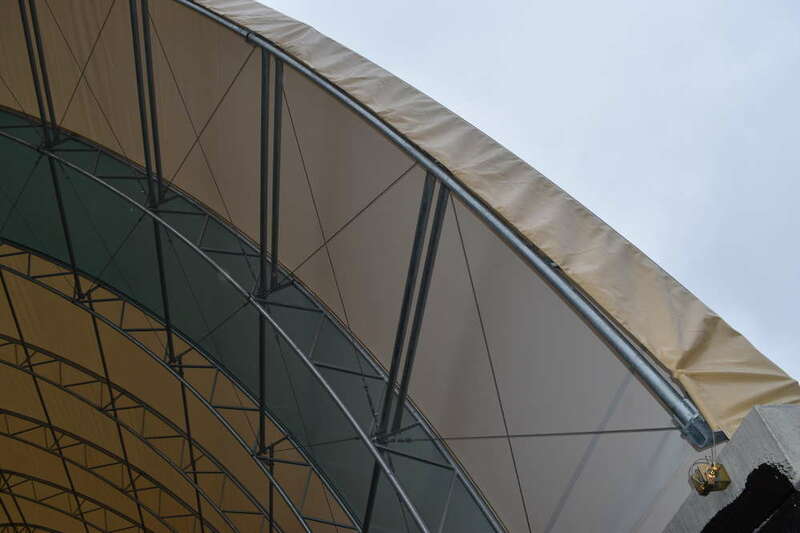 The unique compounds used in the fabric roof and the architectural design of the building provides far more efficient and brilliant lighting than traditional construction methods, according to Hybrid Building Solutions. The truss design with the Keder panel system assures that each fabric panel is supported by a single truss; each truss supports one fabric panel, essentially meaning that instead of a single panel the building is constructed of 16 individual panels. Therefore, if there is roof damage, only one section needs to be replaced, instead of an entire roof. “Hybrid Building Solutions was very easy to work with,” LeClar said. “They were quick to answer any of our questions, completed the project on time, and provided us with a very skilled project manager, Tom Stevens. Their crews were very polite and presentable, and they cleaned up the job site on a daily basis. Tom Stevens, who had previously worked as a highway superintendent, knew exactly what needed to get done and worked hard to get it accomplished. The town did handle some of the aspects of the construction process, including site prep, compaction, surface paving and digging footers, while Hybrid Building Solutions handled everything from the ground up. Chris Bourgeois, town of Boonville highway superintendent, is looking forward to utilizing his new building this winter. The plan is to have a building with the capacity to hold a salt/sand mixture consisting of approximately 13,000 yards of sand and 450 tons of salt under one roof with no material loss or material freeze up, which is easier for their trucks and sanders to handle. While a major project for Hybrid Building Solutions, the town of Boonville's storage building was by no means its biggest. Eighty percent of its projects are for municipalities, yet the company recently awarded a commercial project in Buffalo, N.Y., which includes two 140-ft. by 700-ft. buildings. Hybrid Building Solutions is a WBE (Woman Business Enterprise). The term Tug Hill refers to an upland region in upstate New York that is famous for its heavy winter snowstorms. This consists of the area east of Lake Ontario, north of Oneida Lake, and west of the Adirondack Mountains. The region is separated from the Adirondack Mountains by the Black River Valley. The region incorporates parts of Jefferson, Lewis, Oneida and Oswego counties. Tug Hill's total population is just over 100,000, with two-thirds of those people concentrated in villages around its edge. Tug Hill is noted for its heavy snowfalls, usually described as the heaviest east of the Rockies, though Michigan's Upper Peninsula and the White and Green Mountains of New Hampshire and Vermont rival Tug Hill. The Tug Hill Commission is an agency that was established to assist local governments in their planning and zoning efforts. Overseen by a board of nine unpaid volunteers who are all residents of the Tug Hill region, they are appointed three each by the Governor, Speaker of the State Assembly and majority leader of the State Senate for five year terms. The nine commissioners are chosen by appointing authorities so that two come from each of the four counties that overlap the region, with a ninth member serving “at large.” Commission members set agency policy, budget and program priorities, and oversee staff through an executive director.